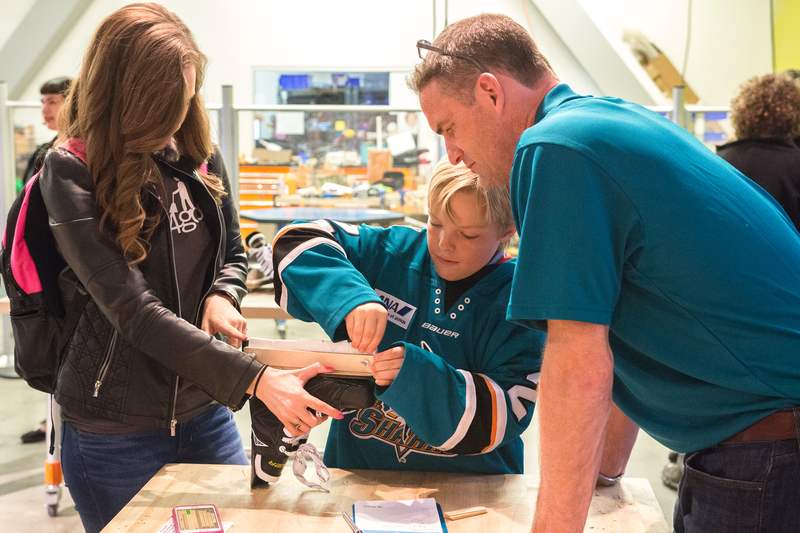 February 22, 2018 San Jose, CA-- The Tech Museum of Innovation is launching a new San Jose Sharks-themed activity designed to connect STEM learning and the game of ice hockey for Bay Area families Feb. 28. 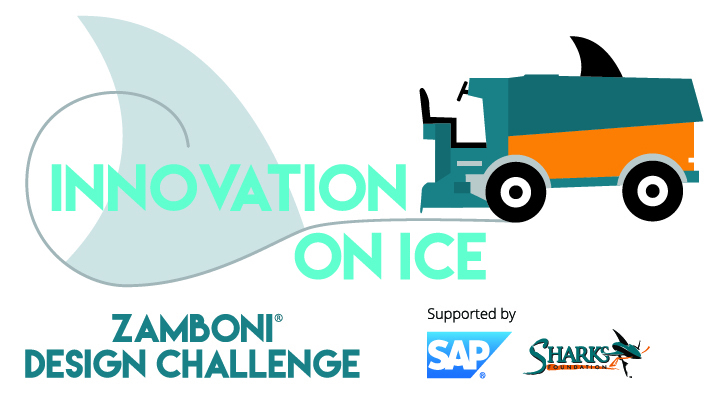 As part of a four-year partnership with The Sharks Foundation and SAP, visitors will pick up new engineering and problem-solving skills with Innovation on Ice: Zamboni® Design Challenge. Innovation on Ice: Zamboni® Design Challenge is a drop-in activity where visitors design their own wind-powered vehicle out of reusable materials. They test their device on a mini Sharks-themed rink, trying to cross certain points to make a “scoreboard” react in fun ways. The engineering design challenge teaches guests about friction, weight distribution and the importance of material selection. Iteration is a crucial part of the innovation process, and visitors are encouraged to adjust their designs and retest. “SAP is proud to support a local program that engages bright young minds, inspires creative thinking and helps them develop skills in STEM. Even better, they’ll get to design and test their big ideas in a fun environment with their families,” said John McGee, Managing Director, West Market Unit, SAP North America. Nearly half a million visitors to The Tech every year learn about robotics, bioengineering, anatomy, immersive AR/VR media, cyber security, the engineering design process, and how to creatively solve problems using technology. The Tech also offers free field trips for Title I schools, bringing 25,000 underserved students to the museum each year for an experience dedicated to STEM learning, including hands-on science labs. “Our mission is to inspire the innovator in everyone and we are fortunate to have the Sharks Foundation and SAP on our team. We believe in everyone’s potential to use technology to solve big problems and love seeing families learn together,“ said Katie Ozawa, STEM Experience Developer at The Tech. The Innovation on Ice: Zamboni® Design Challenge will run daily March 1 through March 17, then join a rotation of programming at The Tech. The challenge is one of several sports-themed tech and engineering activities this partnership makes possible. In another activity, students learn about physics while experimenting with different materials to build a faster ice skate. When: Wednesday, Feb. 28, 3:15 p.m.
Visuals: Students from an after-school program building devices and testing them out on a Sharks-themed rink with the help of select VIP guests from the San Jose Sharks. Please RSVP to Marika Krause at mkrause@thetech.org. The Sharks Foundation is dedicated to enhancing the lives of youth and families in our community with an emphasis in the areas of education, health and safety, and character development. During the 2016-17 season, the Sharks Foundation donated a record-breaking $1.8 million in funding to support the Bay Area. Since its inception in 1994, the Foundation has given more than $12 million to thousands of high-performing non-profit organizations serving youth and families in need. To learn more about how the Sharks Foundation is helping underserved children and families in the community, read our 2016-17 Community Report, visit SharksFoundation.org or connect on Facebook, Instagram or Twitter. Visitors participate in the Innovation on Ice: Skate Challenge with Sharks Alumni Rob Zettler March 8, 2017.